Yarr! Avast! And so on. While it would be easy to write a preview of Raven’s Cry in a ridiculous pirate style, it doesn’t seem fair to bring this dark, mature, action-RPG down to that level. Not least because it’s been going through a bit of a rough patch lately; original developers Octane Games have been replaced with Reality Pump, who have set about moving the entire game onto their GRACE engine. What this means is that the build I saw was incredibly early stuff, so while it looks absolutely stunning, there wasn’t a whole lot of gameplay to see. Our first port of call was St. Lucia, a small smuggler haven that was dark, gloomy, and a perfect hangout for our hero, Christopher Raven. The citizens were living in shacks, and everything was run-down and grimy in a weirdly-beautiful fashion. We quickly moved on to a larger, more opulent port town, but there was a problem – it was controlled by the British, who currently hated Raven for his pirate ways. Because of this, Raven couldn’t just walk through the front gate. I was told there were a number of ways to handle the situation: players can try and sneak around the guard and enter the town, or simply charge in and start a battle with the guard and any reinforcements sent his way. Thankfully, Raven had already hired an assassin to take out the guard upon his arrival, and we strolled into town without a hitch. In town, we watched some citizens going about their business, getting into fights, threatening store owners and other unscrupulous acts. 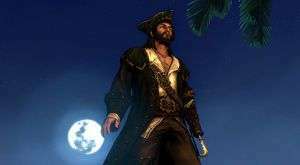 One of the interesting things about the game is the grey morality system, where no act is explicitly good or evil, and fits Raven’s character more than it fulfils your desire to be a benevolent plunderer or ruthless pirate fiend. One example of this is a side-quest involving a serial killer targeting the town’s prostitutes. The obvious route may be to hunt down the killer and bring him to justice, but equally you may decide to help him on his murderous quest if you agree with his motives. Or, if neither option appeals to you, you can just ignore the whole thing altogether. There’ll be plenty of opportunities to stick your oar into other people’s business, and it’ll be interesting to see how these scenarios play out. Not all choices are necessarily driven by morality, however. Turning a corner, Raven witnessed the hanging of one of his crew by those pesky British. I was told that had we arrived earlier, Raven could have tried to rescue his crew member, increasing his infamy with the British but raising morale among his ship’s crew. As it stood, his standing with the British remained unchanged, but now his crew would respect him less as a captain. Keeping morale high aboard the ship is important if you want to avoid your crew leaving your ship to join another pirate, or even staging a mutiny and throwing you off your own boat. Your crew will gain experience the more battles to take them into, so you’ll want to keep them happy to have the best fighting force available. Or you can just replace them with new crew if you get sick of their complaining. It’s all down to you. But why would you go sailing if not to go look for treasure like a true pirate? Treasure hunting is another important aspect to Raven’s life, and we jumped onto an island in search of booty. It’s not just you hunting for treasure though; once there we learned that another band of pirates had reached the island before our own ship, and so it became a race to see who could find the treasure first. Working our way through a dense, beautiful forest, with sun streaming through the leaves and a river trickling down beside Raven, we spied the enemies in the distance, and decided to sneak up on them rather than face a full-on attack. While combat wasn’t in the build I saw, the choreography I saw in fights between NPCs hinted at a well-paced combat system, and there are a couple of cool ideas being thrown into the mix, such as one-use flintlock pistols to quickly level the battlefield. It all sounds very interesting, but we’ll have to wait and see what comes of the hype. One area of gameplay I did get to see, however, was ship battles. With the booty now ours, we dived onto the ship and set sail, only to come under attack by those damned British again. On board your ship, you can switch between your crew members to take advantage of their skills; you’ll need to jump to the captain to steer, then you may want to check in with the scout on top of the mast who can see enemies coming from a distance, before switching to your gunners to line up the perfect shot on your enemy. There’s a bunch of different shot types you can use, from traditional cannonballs to sink enemy ships to grape shots that more effectively take out crew, and chain shots to wipe out enemy masts. Combat here looked well-paced and lots of fun but, again, you have the choice to sail away and avoid it, or try and disguise yourself as one of the enemy by raising their flag, even going as far as painting your ship to match their colours so they won’t attack. At the end of the day, there wasn’t a whole lot of Raven’s Cry to show; indeed, a quick look around the menu told me I was looking at version 0.0.0.1 of the game. 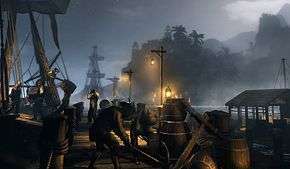 But what I saw is very promising, thanks to the GRACE engine making everything look stunning, and a clearly enthusiastic and dedicated team who are aiming to make Raven’s Cry a dark, mature pirate game sure to appeal to those who have been looking for such an experience, myself included. The last known release date for the game was by the end of this year, but I’d say that 2014 is a much better estimate.